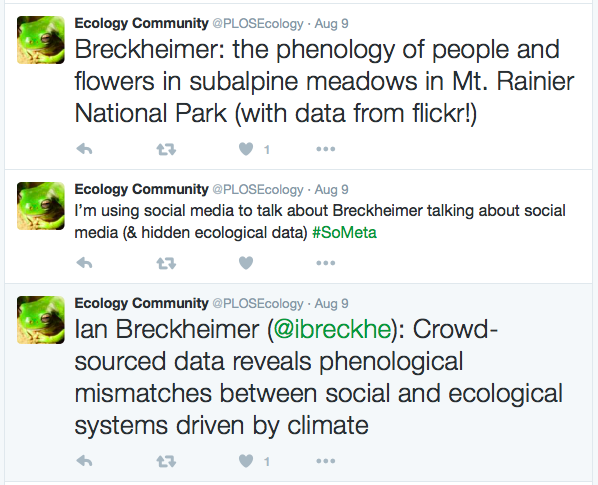 The Ecological Society of America Meeting each August is a chance to engage in the larger community of ecologists, to connect our work with our colleagues, and to hear about the exciting new research emerging across our discipline. At recent ESA meetings, I’ve enjoyed the growing conversation, the so-called “meeting-within-a-meeting,” that pops up on twitter and social media during ESA. Live-tweets and blogged recaps provide a new level of engagement at ESA — alerting me to talks I might otherwise miss in the sea of concurrent sessions, or allowing me to catch a presentation, even if I can’t be physically present for it. I had expected that the live-tweeting and blogging would make me a little frantic and prone to distraction, but I noticed instead that the Ecology Reporting Fellowship forced me to sit still. I was tied to a single session for the whole morning while I live-tweeted, instead of racing from one concurrent session to the next. This made my ESA experience both less and more spontaneous. I didn’t just wander from room to room as I have in the past; I had a strict schedule and little time to happen upon amazing talks from outside my corner of the ecology world. At past ESAs I have had incredible wander-luck: I actually found Richard Primack this way at ESA 2010, and I likely wouldn’t know about Robin Wall Kimmerer’s incredible writing or Eric Sanderson’s Welikia project if I hadn’t gotten lost in the corner of the convention center near their ESA sessions. But tweeting in place all the way through a session forced me to sit through talks that in previous years I would likely miss. I work exclusively in temperate ecosystems, but I stayed through the Climate Change: Ranges and Phenology talks that focused on Mediterranean and Semi-Arid and Savanna Type (SAST) biomes and watched engaging speakers tackle questions that are surprisingly relevant to my research. The blog post on common garden methodology grew organically out of sitting through the first Climate Change: Ranges and Phenology session on Monday afternoon. In previous years I likely would not have seen the repeated use of common gardens in various study systems, I would have jumped into the room for a talk or two, and then left to find coffee, or a talk on temperate plants or National Parks. The work of sitting, staying, and making deeper connections across talks in the same room would be valuable for anyone, whether or not they were live tweeting the session. Tweeting from my own account while I took notes for a blog post — the conversation expands beyond ESA to people who were not in Florida! Science communication begins with communicating among scientists. 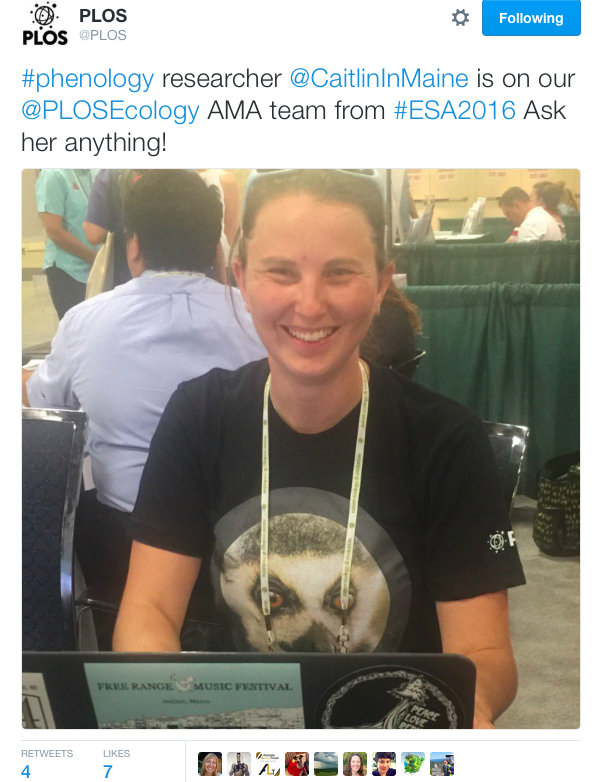 ESA is an opportunity for ecologists to share their work with each other, and many ecologists rose to the occasion with clear, engaging, and memorable presentations. From a social media perspective, I found that the best tweets and the best blog copy were often snippets of behind-the-scenes stories that were included in presentations, but would likely not make it into a publication. 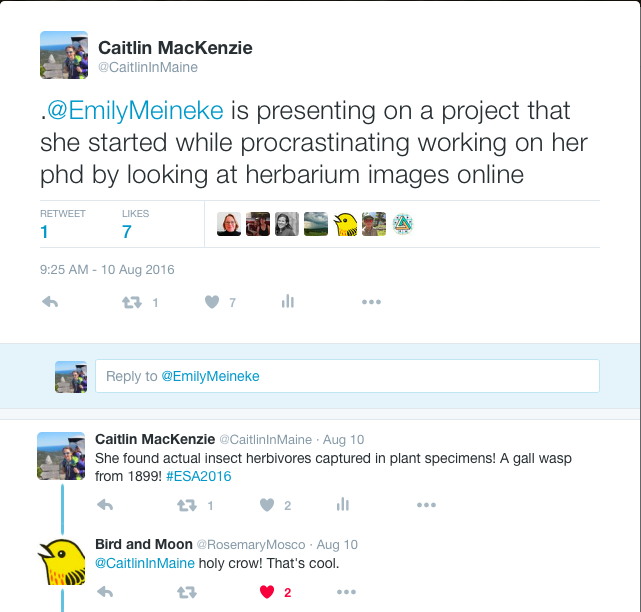 For example, Emily Meineke introduced her talk tracking evidence of herbivory captured in herbarium specimens by confessing the kitchen-table-procrastination origin story of her project. Nicole Rafferty asked the audience to imagine a grocery store in a future without pollinators before talking about her experiments tracing plant-pollinator migrations upslope in Colorado. The ESA Meeting is clearly full of creative science communicators: Fort Lauderdale featured a Fashion Show, a The-Moth-style evening of live story-telling, and a whole session of Up Goer Five talks. But in my opinion, some of the best story-telling took place in the small moments within traditional talks, and I hope my social media coverage of ESA celebrated and elevated these wonderful moments to the larger online community. 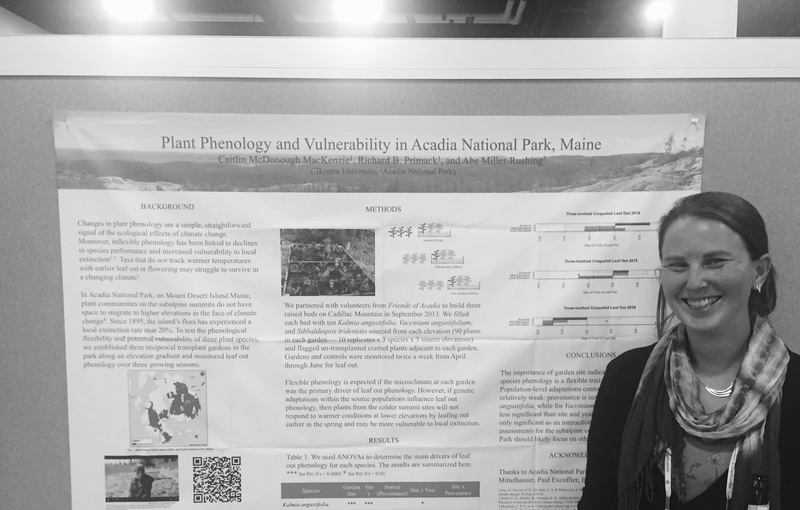 My poster at ESA — I wasn't just on social media all day! "The phenomena of the year take place every day in a pond on a small scale... The night is the winter, the morning and evening are the spring and fall, and the noon is the summer." For a week in 1860—June 30 to July 7—Henry David Thoreau used a thermometer, presumably a mercury thermometer, to record the temperature of Concord’s springs, brooks, rivers, ponds, and a swamp. He found that springs have Concord’s coldest water; brooks emerging from shady swamps are colder than brooks from dry, open uplands; and temperatures of rivers and ponds are affected by day-to-day air temperature. Recently, over the course of 7 years, I repeated many of Thoreau’ observations of water temperatures using a digital thermometer. Springs are still Concord’s coldest waters. For example, Thoreau measured Brister’s Spring at 49 degrees, and it varied from 48 to 52 degrees during my years of measurements. Many of Concord’s brooks have distinctly warmed since Thoreau’s measurements. This is because a dam pond or beaver pond has slowed the water, giving it more time to be heated by the sun than in the past. The temperatures of the brooks are also affected by yearly variations; they are warmer in warm summers and colder in cool summers. On the afternoon of July 12, 2016 (just about one month ago), with an air temperature of 88 degrees, Concord showed that it still has hot and cold places on land as well. 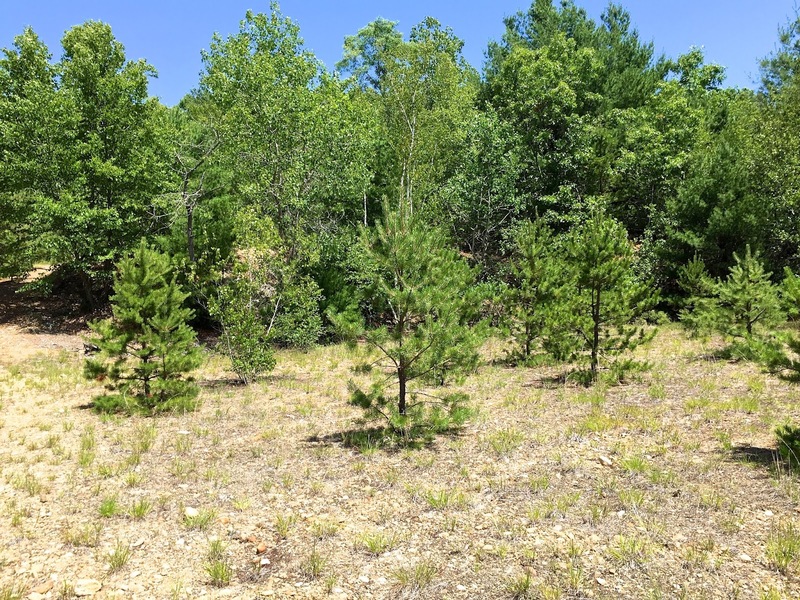 The treeless sand pit near Route 2 on Brister’s Hill is like a solar oven, and that afternoon it had a ground temperature, measured with an infrared thermometer, in the range of 130 to 148 degrees. 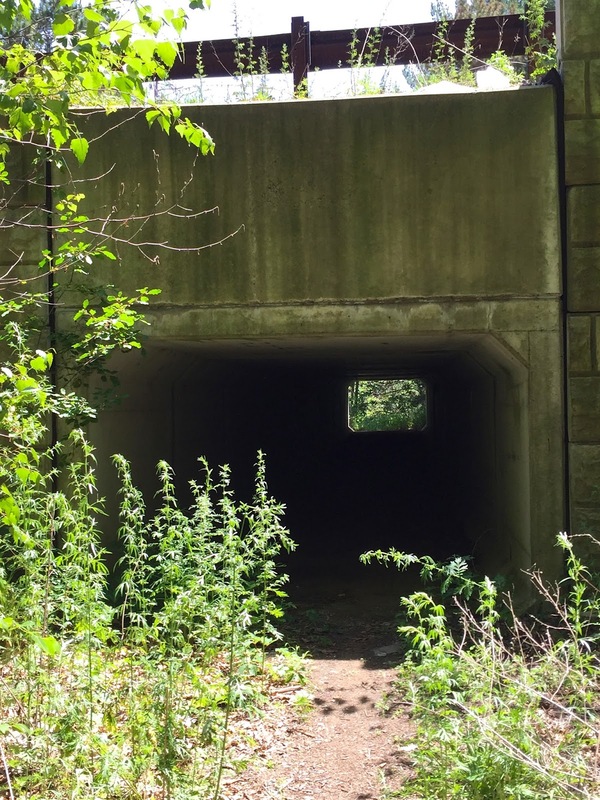 Inside the nearby wildlife tunnel that passes under Route 2, the temperature was a cool 57 degrees, 31 degrees cooler than the outside air temperature. On a summer’s day, Concord residents can walk through three seasons from the cold waters of Brister’s Spring, to the glaring desert-like conditions of the sand pits, and finally the cool autumn climate of the wildlife tunnel, all without even having to cross a road. A longer version of this article was published in the Concord Journal. A major goal of our research group is to inform the public that the effects of climate change can be seen right here and now in New England. We also want the public to know that climate change could have devastating impacts on our economy, coastal environments, and human health. Last week, I was interviewed for a TV program and a radio program where I had the chance to present our results. In both cases, these media outlets learned about our research from my book Walden Warming and articles that I had written for newspapers. This opportunity highlights the value of doing popular writing along with producing peer-reviewed scientific papers. The first interview was with the Connecticut Public Radio program Where We Live. 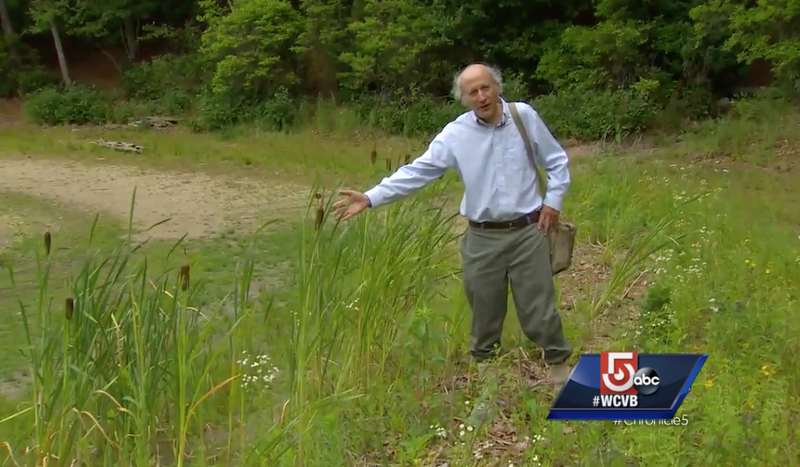 I was the featured guest discussing the effects of climate change on the plant and animals of New England, and the connections to Thoreau and the need to take action. 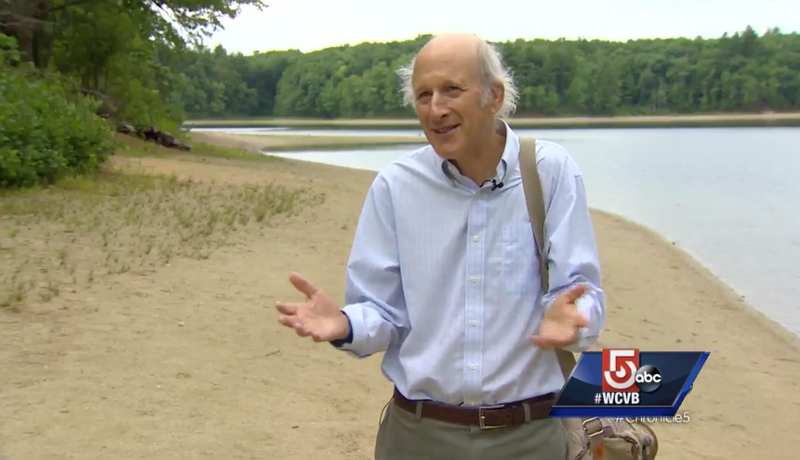 The second interview was for a Chronicle program on the Boston TV station WCVB5 focusing on New England swimming holes (click to watch segments one, two, three, and four). 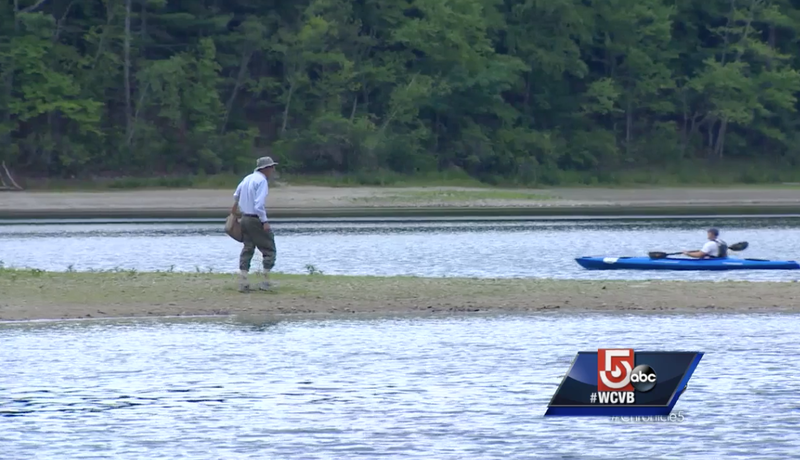 I am interviewed about the low water levels at Walden Pond in segment three.